research facilities around the world. Sports and orthopedic medicine, pediatric medicine, neurorehabilitation, older adult medicine, industrial medicine, and researchers depend on Biodex to provide consistent, accurate, objective data. Objective data that provides the best outcome for their patients... objective data that supports their research... objective data that separates their facility from the rest. Biodex Objective Data helps you communicate need, progress and outcome clearly and accurately. Easy to read and interpret color graphic reports are produced with normative data. Graphic reports and narrative letters compare patient's status to normative data for all joints. Data legends and on-screen editing helps communicate the information in simple terms for patients, doctors, third party payers and employers. The Biodex System 4 offers a level of performance, accuracy, and safety that remains unmatched. Not surprisingly, Biodex equipment marks the highest correlation coefficients for reliability, accuracy, validity and repeatability - another reason why so many clinicians put their trust in Biodex. Our employees strive to keep Biodex at the forefront in innovation, effectiveness, efficiency and reliability. That's why so many world class facilities depend on Biodex. Exported Data Parser makes it simple to convert .csv files into a report format. Isokinetic normative data is available for multiple joints, including data from pediatric through adults, ages 5 - 83. Wide range of normative data, from pediatric through adults, ages 5 - 83. System 4 is dependable and versatile – providing the means to take on new challenges and be adaptable to keep pace with progressive thinking and innovation. Whether your orthopedic and sports medicine practice is allowed only limited visits or you have the luxury of managing a complete recovery, Biodex is the tool that adapts to every environment. Evidence-based clinical protocols combine science with practical application to ensure that you provide the best outcomes. Other capabilities include preseason screening, injury prevention and athletic performance enhancement. Used to treat children worldwide, Isokinetic muscle testing helps clinicians by providing objective data for neuromuscular control and strength. Pediatric attachments and age-based normative data are available. View normative data for quadriceps and hamstrings in children ages 6-13 years. For the management of persons with movement disorders, neurologic pathologies, or general deconditioning; an Integrated Protocol Using Instrument. The system helps patients build strength, endurance and coordination. Spasticity management includes objective quantification at specific contraction. Use Passive mode for repetitive exercises. Eccentric mode is useful for controlled strengthening. Upper extremity attachments for hemiparetic patients. Used by military special forces for injury prevention and performance optimization. Strength testing identifies residual deficits and predisposition for repeat injury. For many industries today, poor muscular strength constitutes a risk factor for on-the-job injuries, and can predict susceptibility to many diseases. Today’s workforce is older and more obese – characteristics expected to present increasing injury and illness challenges. Many workers display a loss of up to 30% of their muscle mass as early as age 55 – and may be unable to meet the physical demands of some jobs in as little as 5 years. As a result, industry executives require objective tools to determine whether prospective employees possess the muscular strength necessary to safely meet the demands of the positions for which they’ve applied. The Biodex System 4 Dynamometer provides objective, reproducible measures that can be correlated with the physical demands of different jobs, as determined by the Department of Labor. Such pre-employment testing enables companies to assess whether job applicants will become true assets to their workforce – or present risks of injuries, absenteeism and susceptibility to disease. Biodex Fall Risk Screening & Condtioning Program has been employed by leading clinics for more than ten years. It is the only fall program that incorporates a complete array of objective tests. Isokinetic testing will identify weakness; exercise will improve ankle and leg strength. Analog Signal Access Interface This optional feature provides real time analog voltage outputs of torque, position and velocity from the dynamometer. Perfect for integration with EMG devices. Customized Motor Control through the use of the Researcher’s Tool Kit provides advanced investigator direct access to the embedded dynamometer systems. The core is an extension to the System 4 firmware which exposes the motor controls to an external interface designed by the researcher. Curve Analysis allows the user to conduct complete neuromuscular evaluation. Note: Learn more about the Researcher’s Tool Kit and the Analog Signal Access Interface. Featuring six modes of operation, the Biodex System 4 continues to offer pioneering breakthroughs in neuromuscular testing and rehabilitative technology. Biodex assessments of physical impairments provides patients a fast, effective, documented return to function. The Biodex System 4 is unusually sensitive to your patient's limits. Progressive and interactive features keep you in complete control. Dynamic and static muscle loading environments provide unlimited combinations of technique and application. The Isokinetic Resistance mode for testing and rehabilitation is totally accommodating throughout the entire range of motion. Biodex's unique impact-free acceleration and deceleration eliminates joint trauma, allowing patients to exercise and be tested at more functional speeds. Resistance continuously matches effort, accommodating to variations in patient force output due to weakness, pain or fatigue at specific points in the individual's range of motion. Research along with over 30 years of clinical application has demonstrated that isokinetic resistance is a safe, objective means to quantify physical impairments with a high correlation to function. Isokinetic testing is the standard for muscle and joint assessment. Applied torque response ensures that the patient's limb velocity increases or decreases in proportion to the torque applied during acceleration and deceleration, enabling neuromuscular control measurements. Choose concentric and eccentric contractions to perform isolated polymetric exercises. Concentric torque up to 500 ft-lb (680 Nm) and eccentric torque up to 400 ft-lb (542 Nm) accommodates the demands of high performance athletes and sports medicine researchers. The System 4 responds only to the patient's force output. To initiate movement, the patient must produce and maintain a pre-determined minimum amount of force. This loads the muscles surrounding the joint, producing a pre- load, thus stabilizing and protecting the joint. Accommodates the demands of today's athletes and sports medicine researchers. The Passive Motion mode is a multi-function modality. Unique control properties allow for early intervention in all patients throughout all phases of rehabilitation. Passive speeds can be set as low as .25 degree per second and as fast as 300 degrees per second. The very slow speeds allow for overcoming the natural stretch reflex. Ideal for proprioceptive testing in early stages of rehabilitation. Biodex software includes specific protocols for active and passive joint repositioning. Higher speeds in passive mode are ideal for active assistive exercise. The Isometric mode is commonly used pre and post operatively or when pain associated with motion is a factor. Isometric contractions are effective at developing strength and decreasing joint effusion while avoiding painful points in the range of motion. Biodex software automates the rehab process with automated multiple angle isometric protocols. Work the agonist, antagonist or both muscles at specified joint angles. The Isotonic mode allows velocity to vary while providing inertia-free constant force and concentric or eccentric muscular contractions. Allows for functional task simulation when using work simulation tools, e.g. turning a doorknob. Because the force is selected, the Isotonic mode also provides protective pre-loading of the joint prior to movement. Ideal for work simulation. Constant force muscle loading is considered functional, as natural activities normally involve moving a constant weight object at varying velocities. Enjoy complete freedom in planning the mode and level of clinician interaction that works best for each patient. Touch panel controls give clinicians the hands-on ability to adjust torque, speed, range of motion and other clinical parameters in real time. The Biodex System 4 also allows clinicians the option to select automated test and exercise sessions. Any sequence of modes can be employed automatically. The Researcher's Tool Kit Software (optional) allows for advanced specialized system control. Ideal for researchers investigating neuromuscular performance. Ability to apply position based customized motor control and data export.. Export Data Parser produces .csv files with preformatted header. 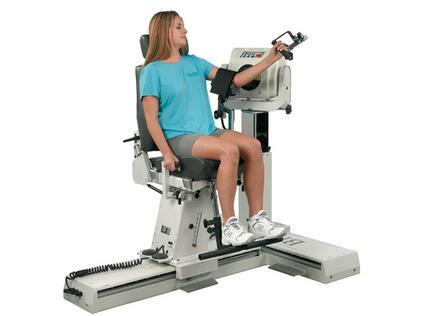 System 4 Pro Patient Positioning System with motorized seat height, front-to-back chair adjustment, fully assisted dynamometer height adjustment, and side-to-side adjustment. *When sold complete with computer, monitor and printer.